Of all the technological advances of the 19th century, few capture the imagination quite like railway locomotive. Steam-powered, they heralded a new era in transportation, allowing people to travel further and to places previously hard to reach by other means, and goods to be carried in greater amounts, which of course led to bigger profits. Writers of the time paid homage to the new mode of travel in poem and prose, but not everyone was enamored with the train’s hold on the public’s imagination. Nevertheless the locomotive was here to stay, and rail lines stretched across continents. The use of rail as a means of transport exploded in the States during the 1830-40’s, expanding from seventy five miles of track to two thousand eight hundred miles in just ten years. Rail opened up a new world to the Americans, showing them places far beyond their own town or city. At first, the States imported British engines, but soon it was doing its own business in design of locomotives. By 1880 it was producing more than a thousand trains a year. Trains were also being used in Europe to transport soldiers to war regions and the rest of the world was beginning to benefit from the advantages of a rail link-up with neighboring nations. Russia began building their Trans-Siberian Railway in 1891, a major arterial line which crossed central Asia and cost almost one and a half billion rubles to build. In 1914, around the same time as the Trans-Siberian Railway was finished, California began building its own version, the NorthWestern Pacific Railroad. When it was completed in October that year, crowds in their hundreds turned up to celebrate the exciting new mode of travel. The Railway was christened with Californian wine wrapped in an American flag. It was a moment of patriotic pride and great optimism, and was captured on film for posterity. The Redwood Empire Special in Sacramento was another line expected to do marvelous things for the economy, as it carried massive amounts of timber to 21 states. 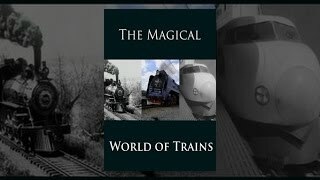 The Magical World of Trains also examines the romance of the railway; The Great Train Robbery which was immortalized as a film, and introduced the world to Butch Cassidy and his gang, known as the Wild Bunch, who blew up a safe on a mail train. Other famous train robberies followed; most notably Britain’s biggest heist on the Royal Mail train in August of 1963. Films and plays began to spring up featuring trains heavily in their plot, including one of the world’s earliest “talkies”, which had a couple stranded in their car on a railway line. It was a setup that was repeated countless times over the years. Alfred Hitchcock used trains in two of his movies — Strangers on a Train and North by Northwest. These days, trains are used as glamorous billboards to promote blockbuster films, such as the DaVinci Code. Today, train travel is one of the most widely used modes of transport and also, at least domestically, one of the most affordable. Trains are getting faster and more efficient — most notably Japan’s Bullet Train, which can travel at around 190 to 250km per hour, handy when you’re in a rush! Japanese bullet trains are well known for their punctuality, and have moved from diesel engines to electric power. Even as modern rail travel is getting faster, there are still relics of the old steam engines in use around the world, mainly for the benefit of train enthusiasts and those with a romantic spirit, who want to relive the past.